Tailored by Madcap England 1960s Mod 3 button suit jacket in a stylish Retro slim cut. The subtle Prince of Wales check pattern on dark blue ground is complimented by self fabric covered buttons, slim notch lapel and of course the obligatory right side Mod ticket pocket. A style that draws inspiration from classic Italian tailoring and sophisticated Mod fashions. Team with matching Retro slim leg trousers and tailored Mod high fasten lapel waistcoat to create and awesome 3 piece suit. - Tailored by Madcap England 3 button Mod Check suit blazer. - Subtle Prince of Wales check pattern on dark blue ground. - Slim Retro notch lapel with boutonniere button hole to left side. - Mod right side ticket pocket. - Classic blue lining with a hint of fuchsia piping trim. - 3 covered button single breasted fastening. - 3 covered buttons to non-working cuffs. 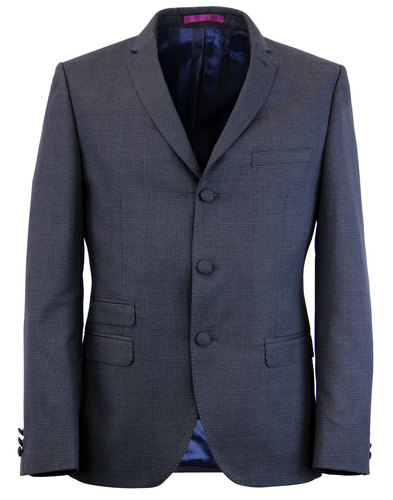 - SKU: S16537SB3 150 Mod Check Suit Jacket. Composition: 65% Polyester, 35% Viscose. Lining 1: 51% Viscose, 49% Acetate. Lining 2: 50% Viscose, 50% Acetate. Lining 3: 100% Polyester. 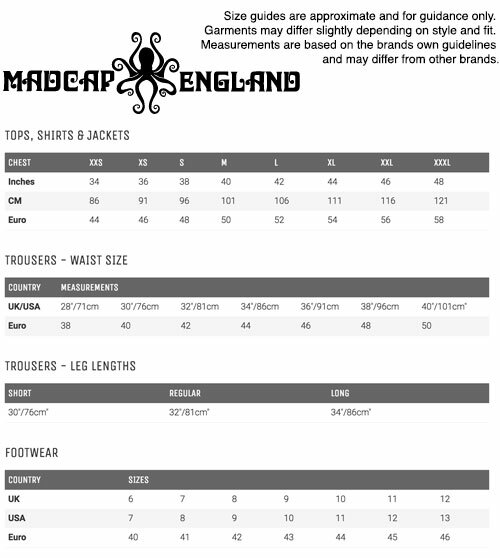 Tailored by Madcap England Mod Check Men's slim fit suit trousers. A subtle Retro textured Prince of Wales check pattern works brilliantly against the dark blue ground. 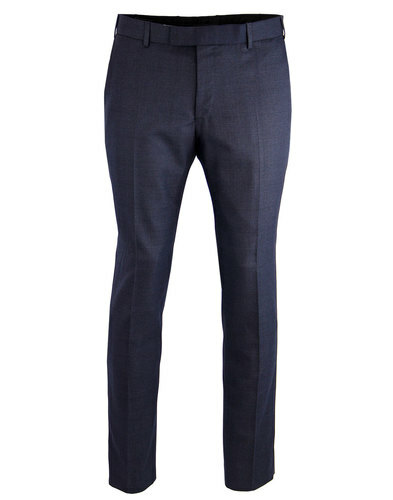 Fantastic Retro slim suit trousers inspired by classic 1960s Italian style and iconic Mod fashions. Team with the matching Mod 3 button blazer and high fasten lapel waistcoat for a refined and sophisticated look. 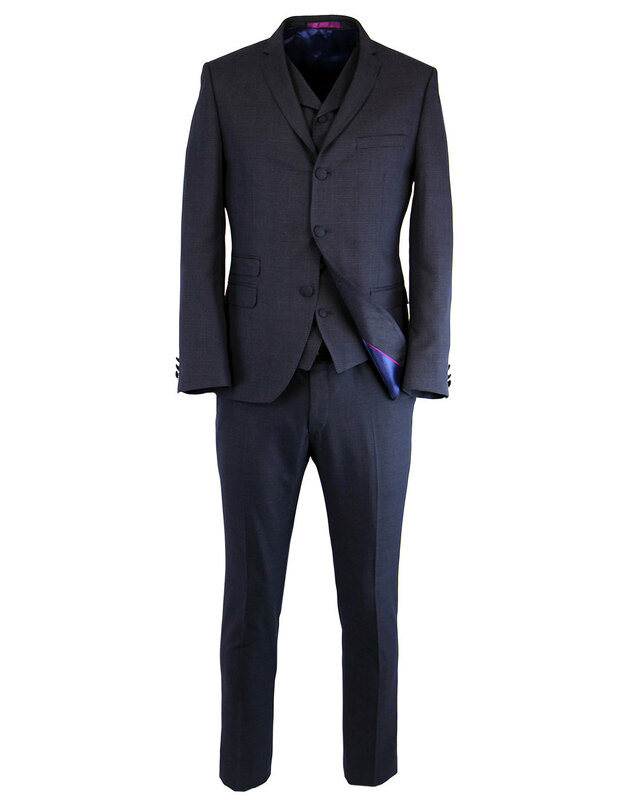 - Tailored by Madcap England Mod Check Suit Trousers. - Subtle Prince of Wales Check Pattern. - Slim Retro cut from thigh to hem. - Clasp fasten waistband, zip fly. SKU: S16537SB3 150 Mod Check Trousers. Short Leg - 30 inch inside leg. Regular Leg: 32 inch inside leg. Long Leg: 34 inch inside leg. 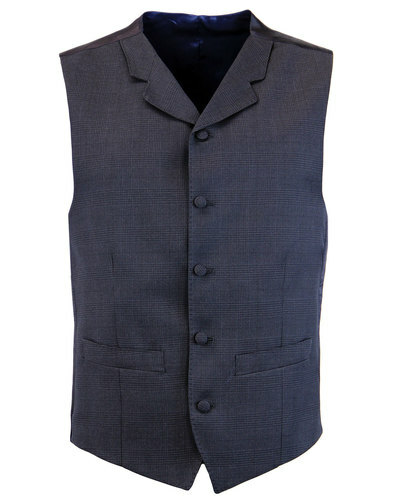 Tailored by Madcap England Men's Mod Check waistcoat. Incorporating a stylish Retro Prince of Wales Check pattern that adds a subtle texture to the classic blue ground. Inspired by classic 1960s tailoring, the notch lapel, high fastening and covered buttons are a homage to classic Italian sartorial style and indeed iconic Mod fashions. Team the Madcap England Mod Check Waistcoat with matching 3 button blazer and Retro slim leg trousers to create the perfect 3 piece suit. - Tailored by Madcap England Mod Check 5 button waistcoat. - Subtle Prince of Wales check pattern on blue round. - Retro slim notch lapel. - Fitted waistcoat with Retro buckle adjusters to back panel. - Nice pleat detailing to front. - Traditional waistcoat dropped point front hem. - Blue lining with striking Retro fuchsia piping trim. - Navy blue satin like back panel. - Mod self covered buttons. - SKU: S16537V5 150 Mod Check Waistcoat. Composition: 65% Polyester, 35% Viscose. Lining 1: 50% Viscose, 50% Acetate. Lining 2: 100% Viscose.